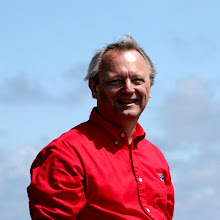 Ben's Blog: Who's S.M.A.R.T and Who's Not? Who's S.M.A.R.T and Who's Not? 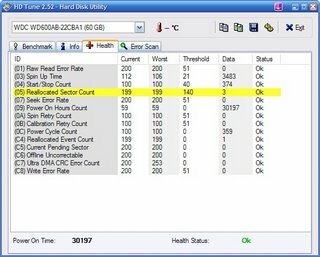 A couple of weeks ago, I wrote about the problems I was having with a Western Digital 250GB. These continued. I finally downloaded their Data Lifeguard utility and ran it. Interestingly, it will run against a USB-connected drive so I didn't have to move the drive over to an IDE connection. 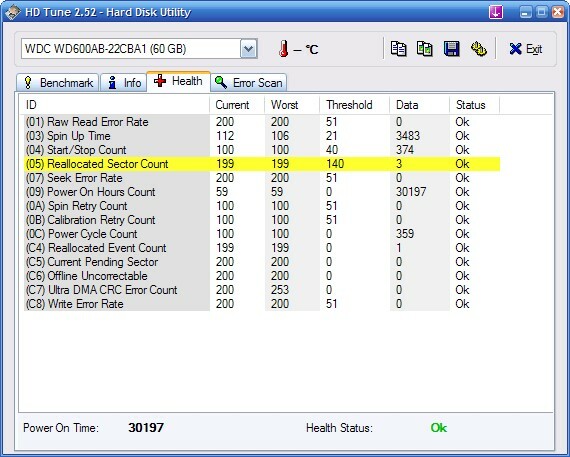 Notice in the background that the SMART (Western Digital uses it without the periods so I will too) status is X FAIL. It did say that there were some bad sectors that "may be repairable!" I clicked on "Repair" and it completed immediately. Seemed odd to me but what do I know? So then I ran their SMART display again and it had a X next to Raw Read Error Rate and a 1 in "Warranty." Still, they said they repaired the bad sectors. So I ran the extended test again. Again, it took hours, overnight actually. However, this time it didn't find any errors. Whew! I went to Windows and reformatted the drive. Another run that took hours and hours but no errors. So I ran their SMART display and more Xs and 1s under "Warranty." 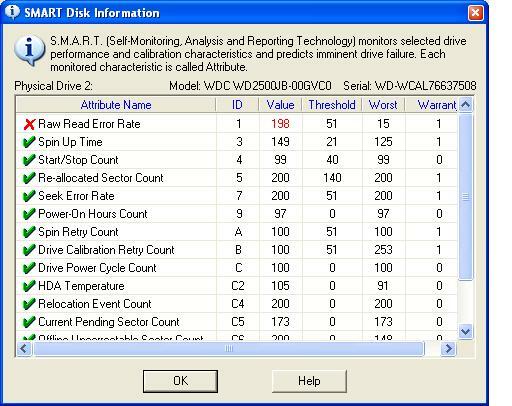 I printed off these SMART reports and packed this drive up and sent it to Western Digital. The replacement should be here tomorrow. So today I went to my desktop (SERVER) and began using VideoReDo to edit out the commercials in a bunch of programs I'd recorded. It seemed to me that the system was being sluggish but nothing else was running. I downloaded HDTune and ran it against the 120GB Seagate. 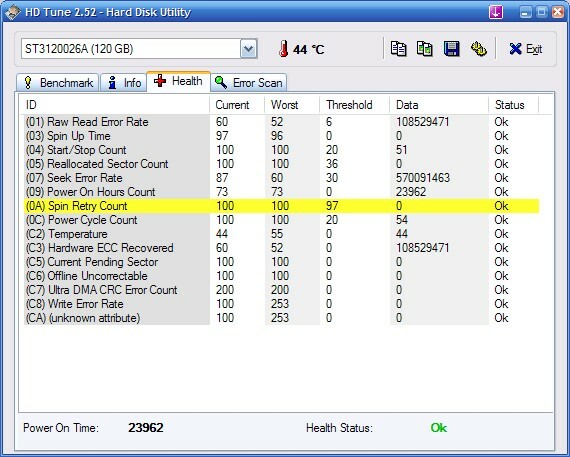 Look at those HUGE numbers under things like "Raw Read Error Rate" and "Seek Error Rate." So I downloaded Seagate's SeaTools. It created a bootable diskette and I ran that. "No problems." Yeah, right. I called Seagate yesterday and spoke to Mick. Mick was very knowledgeable on this drive and the error indicators. 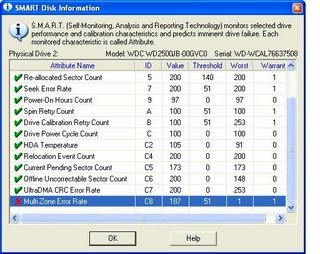 He said that Seagate doesn't use the SMART counters in the standard way so that the results of HDTune weren't accurate. I asked him how I could display the recoverable error counters. He said that they didn't make that available. 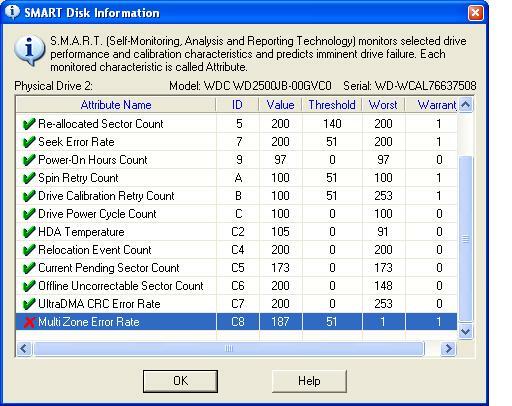 The only diagnostics the customer can run are the SeaTools. Hmmm. Just to make sure I wasn't nuts, I ran HDTune against my boot drive, the 60GB Western Digital that came in this HP system. Can you say "Clean as a whistle?" And to make my day a total mess, I ran HDTune against the 80GB Seagate on my SageTV box. Now I think I understand why this box seems slow at times. With HDTune, I could actually sit and watch these counters increase. For you faithful readers, this 80GB Seagate is the same as the one mentioned here. So, now what? Right now, I'm just wringing my hands. I have a couple of conclusions and still some questions. OEM drives are better than after-market drives. 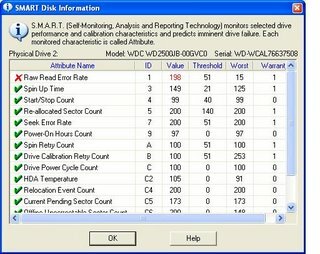 I can't explain this but all the drives I'm having problems with were bought in the after-market (from reputable businesses, e.g. CompUSA, CircuitCity, etc.). I think that the PC malaise that some people report are actually hard-drive problems and not exclusively cooties. 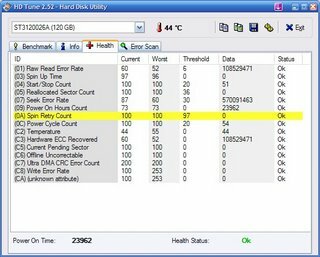 Manufacturers' diagnostics are self-serving. Both vendors I used gave clean bills of health to drives that were eaten up with correctable but degrading errors.